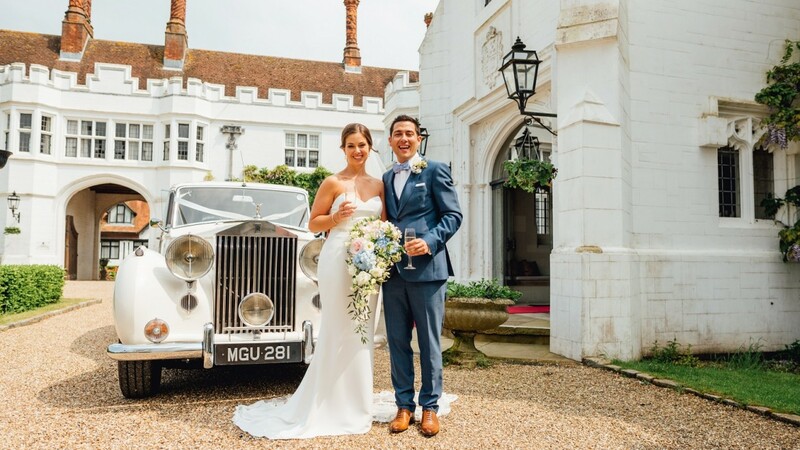 For one of our 2018 summer weddings, we got to work at one of my favourite places, Danesfield House Hotel. When Eleanor arrived for her consultation, I realised that I used to work with her mum, Caroline. Practically every day I’m reminded of what a small world Gerrards Cross is! But, back to the bride. Eleanor is a petite lady with big ideas and she was very specific about what she was looking for, which made our job much easier. 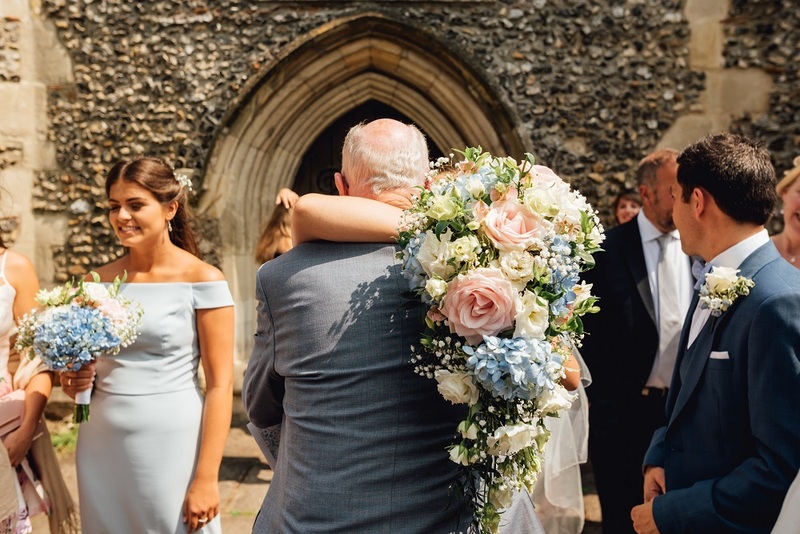 Eleanor decided on a teardrop bouquet, so we needed to take into account her height in order not to overwhelm her with the size of the bouquet. 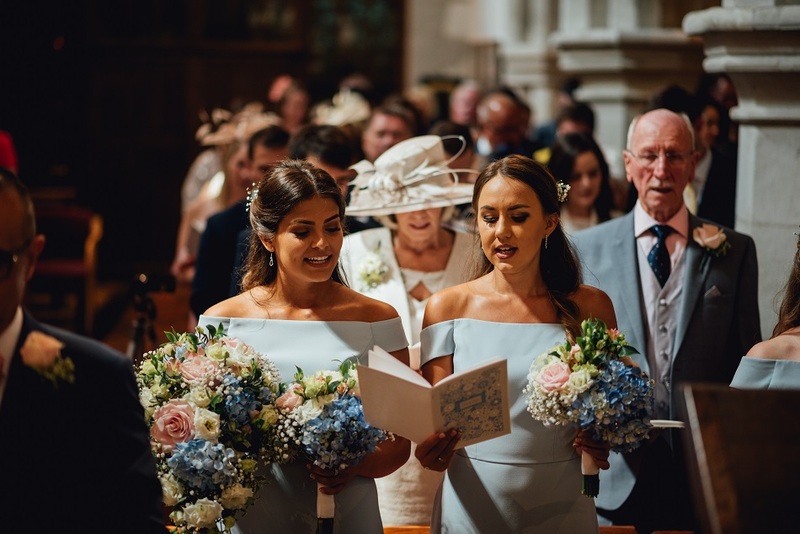 Her three bridesmaids carried hand tied bouquets of the same flowers. 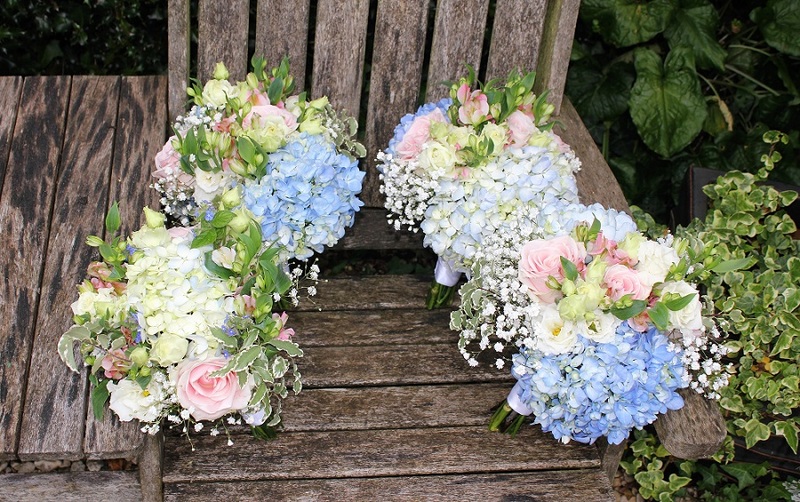 The colours that Eleanor requested were pale blue, a little pink, white and ivory. 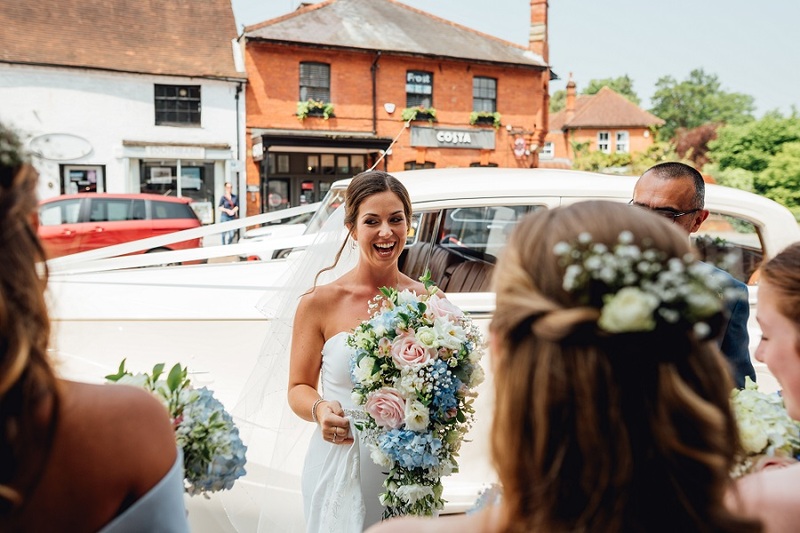 We used pale blue Hydrangea (a favourite of the bride’s), Sweet Avalanche Roses, white Lissianthus, ivory Spray Roses, pale pink Charmelia Alstromeria and a little white Gypsophila to tie it all together. 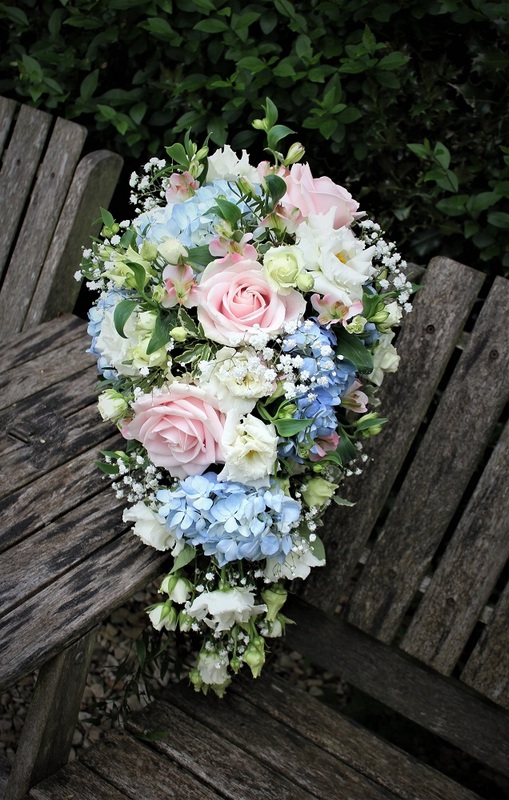 I also used the same Gypsophila and tiny rose pins for the bridesmaid’s hair to compliment their bouquets. It’s a great idea to ask your florist for hair decorations that can be included in combs, slides, circlets and hair bands. Get some inspiration here. 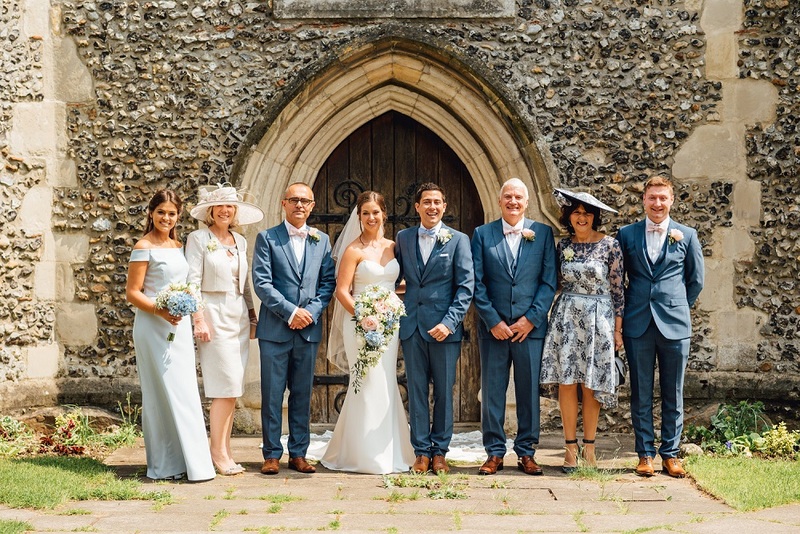 The ceremony for Eleanor and Craig took place at the Chalfont St Giles Church, a beautiful building of Norman architecture, dating back to the 12th century. 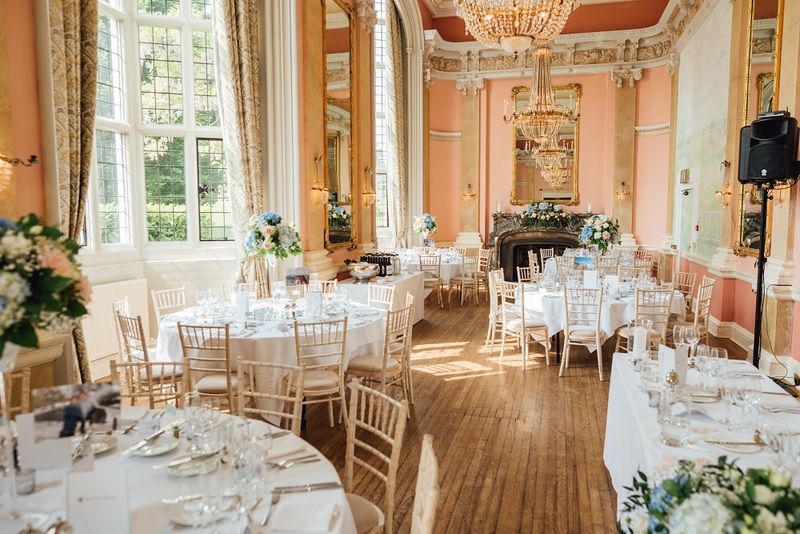 Their reception, however, was held in a particular favourite of mine – The Versailles Suite at Danesfield House Hotel. It is a truly sumptuous room with high ceilings and windows that fill the entire space with natural light. 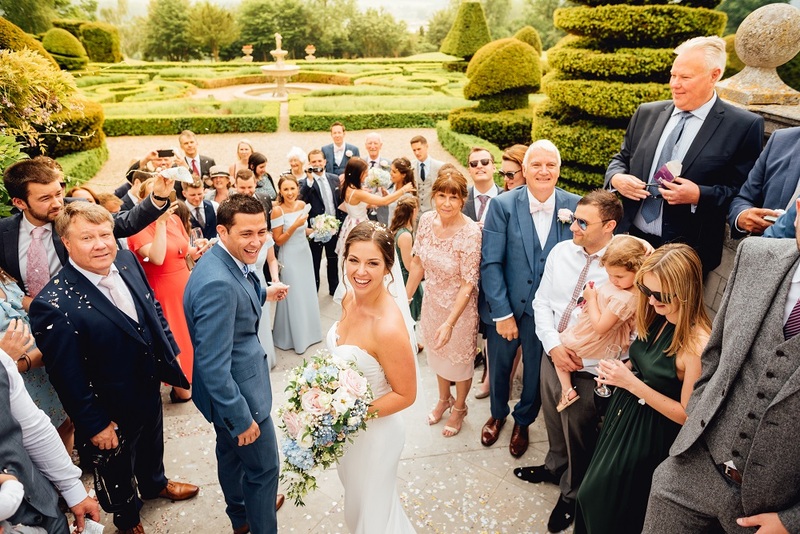 Previously brides have chosen blush pink and/or white for the Versailles suite in Danesfield House because of the strong pink decoration inside. But in Eleanor’s case, the addition of the soft blue worked perfectly in the room. 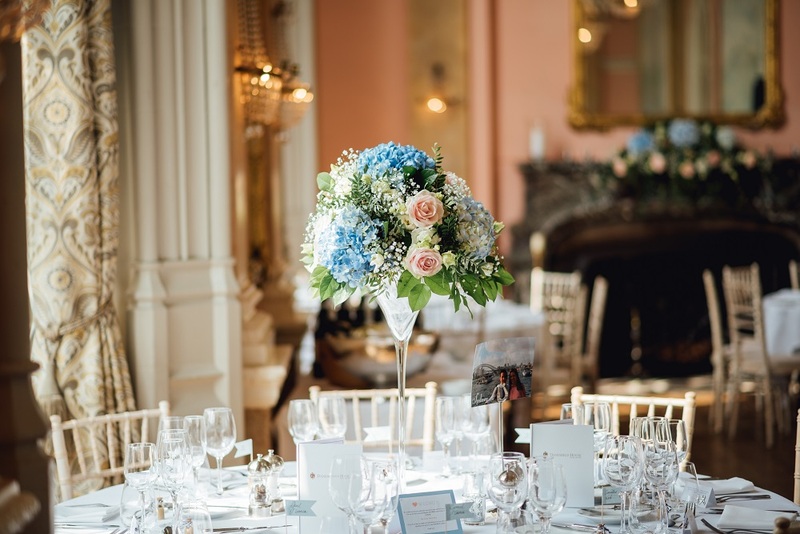 It’s not essential that the colours of the bouquets and decorations are consistent with the room décor. Colours that compliment the walls look lovely and those that contrast can create a striking effect for your guests to be wowed by. The suite is incredibly grand in style, with hanging chandeliers and wall trompe de l’oeil. With all this grandeur you would think that additional decoration could be kept to a minimum. However the ceilings are very high so tall arrangements work best in the room. 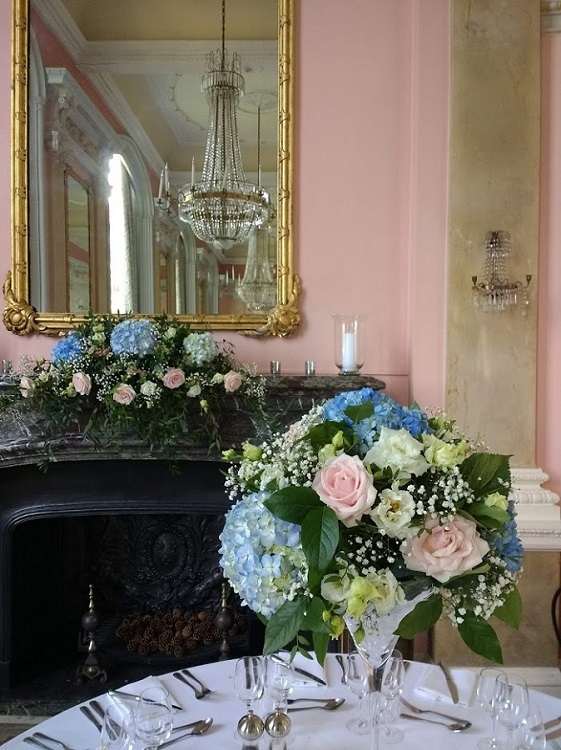 The mantelpiece is a focal point in front of your ceremony (should you choose to have it here) so that, too, benefits from garlands of flowers or a long arrangement to cover some of the space. For the mantelpiece, Eleanor chose an arrangement that mirrored the one on the top table. We also placed storm vases and pillar candles in these areas along with some silver tea light holders. The table centrepiece arrangements were set in tall martini vases. 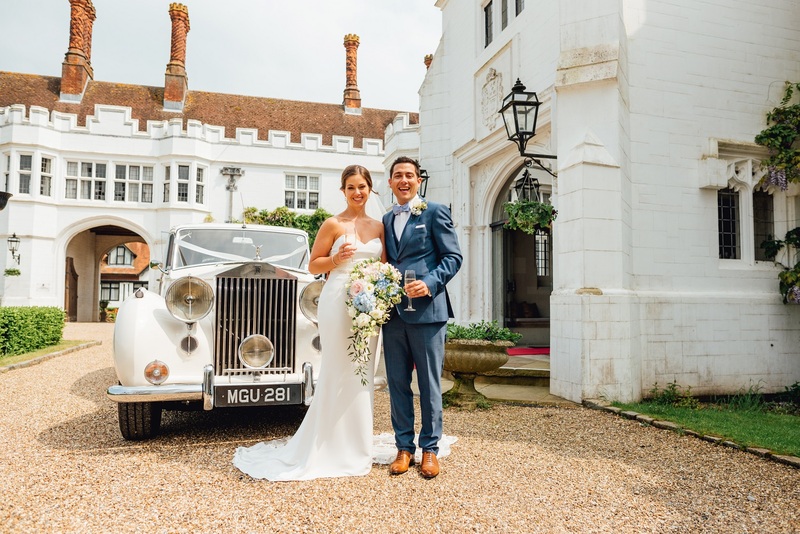 Danesfield House is always such a pleasure to work at – the staff treat us almost as guests, and are always so gracious and polite. It is for this reason that I have chosen to stay there in the past for a spa weekend and dined in The Orangery restaurant – I would highly recommend it! As I am always doing weddings in the summer, I have unfortunately missed out on having afternoon tea on the terrace (the views are spectacular across the gardens and valley) but this is definitely on my radar. As soon as I get a Sunday off, and the sun’s out, you’ll find me there! “Debby, thank you so much for my flowers! 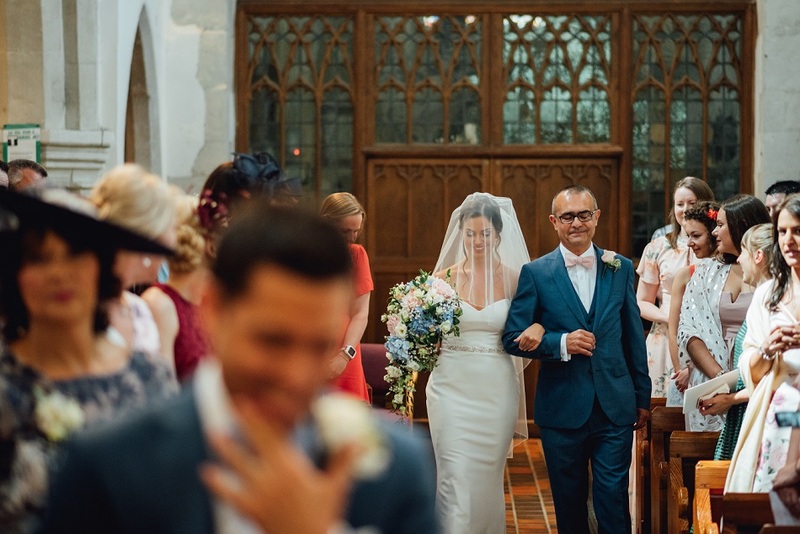 They were all so beautiful and I couldn’t have wished for anything more – Just perfect!” – Eleanor. “Thank you Debby for everything: the flowers, the advice beforehand and the attention to detail. All the flowers were amazing and the roses particularly were just perfect. 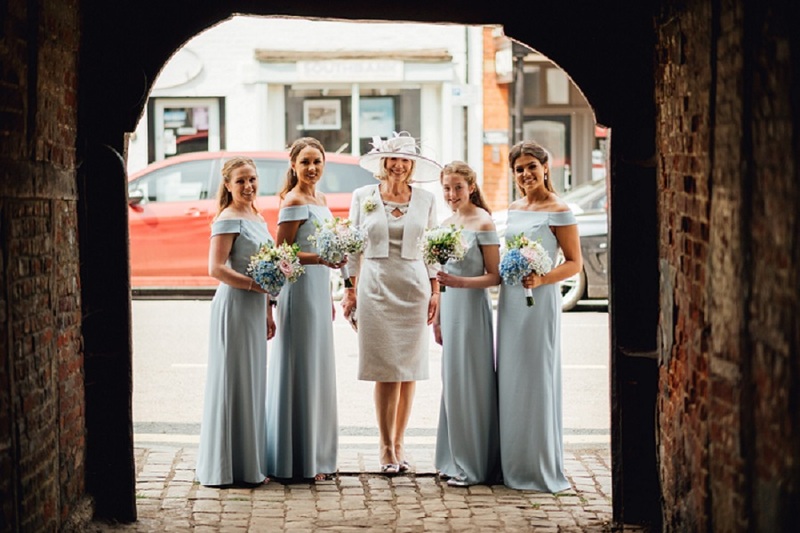 Thank you so much for a fabulous job” – Caroline, mother of the bride. Credit to Che Birch Hayes for some of the amazing photographs featured here.